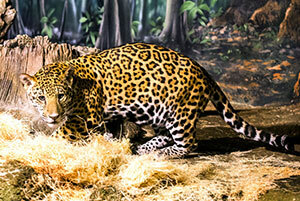 Our male jaguar cub, Francisco, is now 8 months old and weighs about 80 pounds. He eats about 2.5 pounds of food per day and particularly enjoys beef, mice and rats. Francisco has really started to like scent enrichment lately, since he’s at the point in his life when many cats develop a more sophisticated sense of smell. He likes perfumes and spices, and his favorite scent is Obsession for Men, just like his dad, Pat! As Francisco has grown, his behavior has become more like his dad’s. He is more laid-back and cautious than his older brothers, whose behavior is more like their mother Stella. He’s beginning to stalk his keepers and practice his hunting skills. He likes to hide behind his toys and jump out to playfully scare his keepers when they’re feeding and training him. Francisco can be seen on exhibit most days from 10 a.m. to 4:30 p.m. He’s currently being introduced to the outdoor jaguar yard, so on warmer days (about 50 degrees and above) he can be seen outside. His activity level varies, but he’s usually most active when he is first put on exhibit in the morning and then spends late morning and early afternoon napping.